Chateau Whistler Golf Hole 1 (right): The opening par five golf hole is dead straight and actually has one of the lower stress tee shots of the day. Avoiding the crossing creek and the hazard to the right are the obvious goals to starting with a good score. Chateau Whistler Golf Hole 2: This is a short, uphill par four with a pretty wide driving area. However, it is the second shot that matters, as it is also uphill over a creek with a shallow and steeply pitched green from back to front. Chateau Whistler Golf Hole 3 (left): This dogleg par four has one of the more challenging drives anywhere as it is uphill and tight and requires a long drive to have any chance of going for the green. If the drive is too short or too far left, it'll be blocked by enormous trees. If too far right, it'll be a long shot uphill and over the creek to the green. The moral of the story is: if the player doesn't hit a perfect drive, they should lay up and go for bogey. Chateau Whistler Golf Hole 6 (below): The longest par four on the course requires a bombed straight drive. Even this will leave a pretty long shot to the green, which is well guarded by bunkers and slopes that will kick shots away down hills, leaving tough up and down efforts. Chateau Whistler Golf Hole 8: The signature golf hole is a long par three with a narrow green nestled between a lake to the left and a rock face to the right. There is room short of the green, but if not accurate, a large number will most likely be what the player writes down on the scorecard. Chateau Whistler Golf Hole 9: The finishing golf hole to the front nine is a short par five that plays quite a bit longer. The tee shot is actually downhill on this dogleg right. If the drive can slide between the bunkers and the trees, the player may be able to challenge the green in two. However, if driver is hit and pushed or pulled, it is in big trouble. The prudent golfer can play as a relatively straight forward par five, although the elevation change from the landing area up to the green is significant and requires many more clubs than the yardage indicates. Chateau Whistler Golf Hole 10: The back nine opens with a very short, downhill par three that requires precision. The green is surrounded by bunkers and worse, so club choice and accuracy will be crucial. Chateau Whistler Golf Hole 11 (right): The back nine is much shorter than the front and this is the first of 4 par fours under 400 yards that offer a chance to score, IF the player can hit a straight drive between the trees. 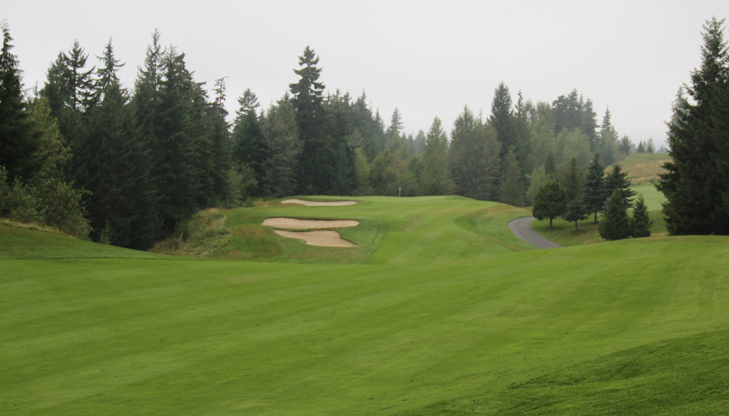 Chateau Whistler Golf Hole 13 (below): This short, downhill par four features a lot of bunkers. Avoid those, and a good score can be waiting. Chateau Whistler Golf Hole 15: This is another downhill par four, and this one is a slight dogleg right that requires precision off the tee. The angle is better from the left side, but not from the rough or trees over there. Chateau Whistler Golf Hole 17: This brute of a par four has a tough drive with tree and hazard trouble on both sides. Then, the green is guarded by an enormous tree to the left side and a steep bank to the right. Chateau Whistler Golf Hole 18: The final golf hole of the day has tree trouble down the right the whole way and a creek that has to be crossed after the drive. Avoiding the bunkers, however, is the more immediate job to finish strong. Nicklaus North Golf Club Review.